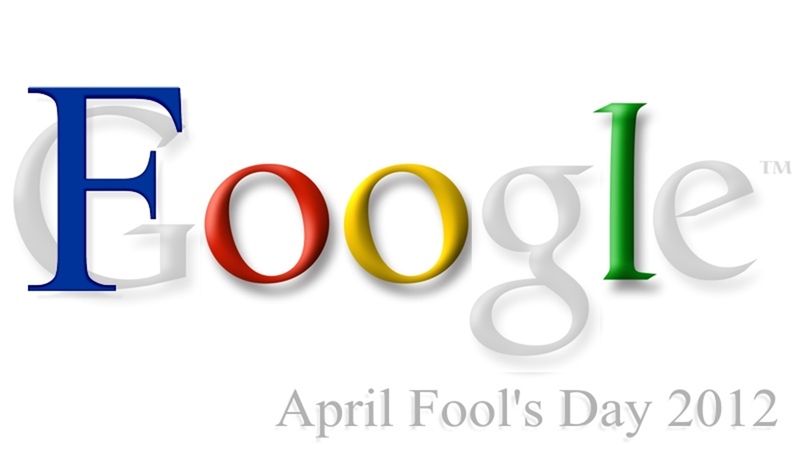 Today on the 31st of March 2012 we are reflecting on some of the best previous years “April Fools” jokes by Google. 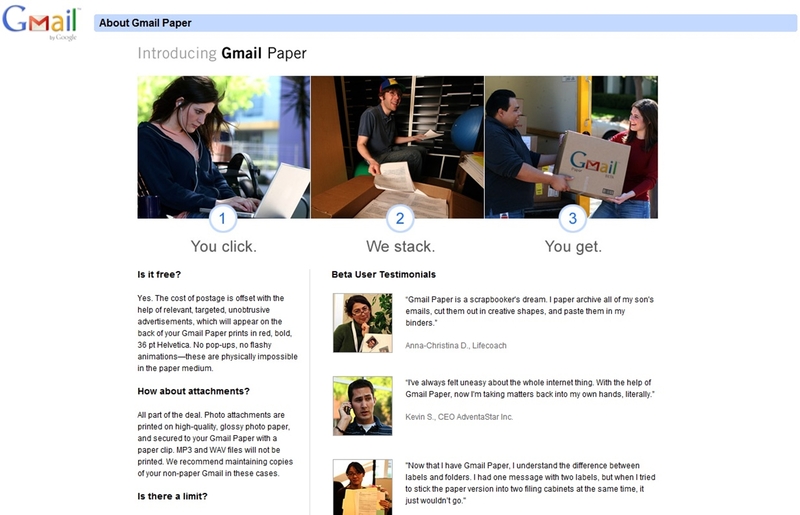 At the same time we are also wondering what kind of April fool’s joke Google has planned for 2012. We suspect that Google will use some sort of Google Doodle on April, 1st 2012 that would have the whole Google+ and Google user base talking about the April fool’s joke. Many of our readers may not know this but Google have a long history of April fool jokes. In this article we will discuss some of the Google April Fool Jokes. page. 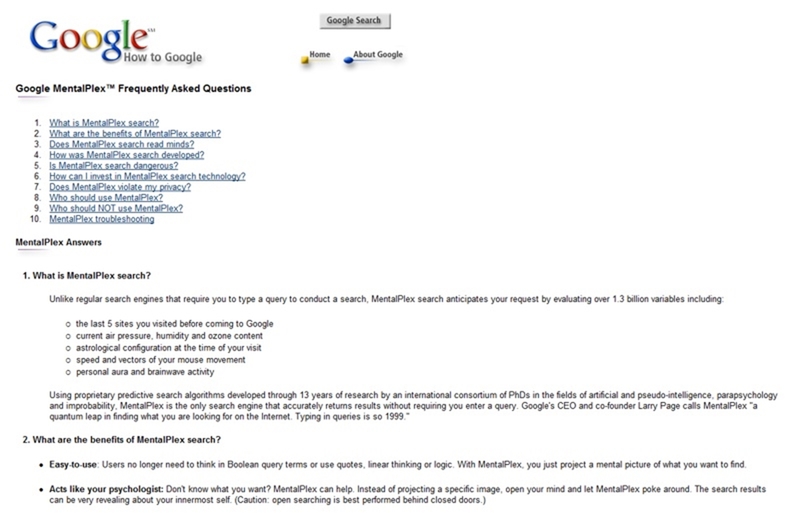 They have announced the “New Smarter and Faster with Google MentalPlex joke on their FrontPage with instructions on how to use the MentalPlex Search System. 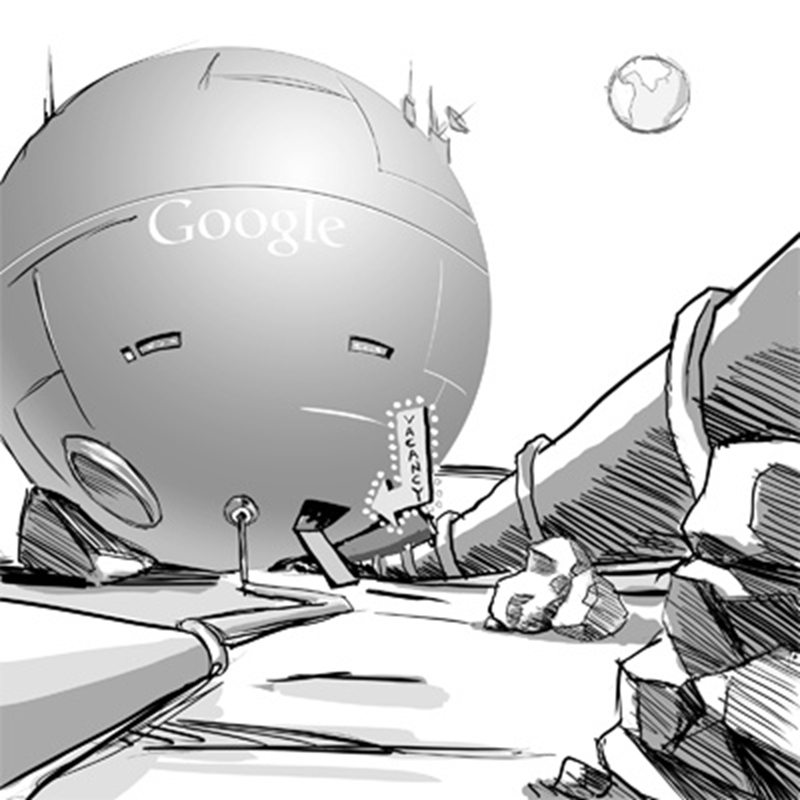 Search” – Image of the Google April Fool’s Joke 2012. 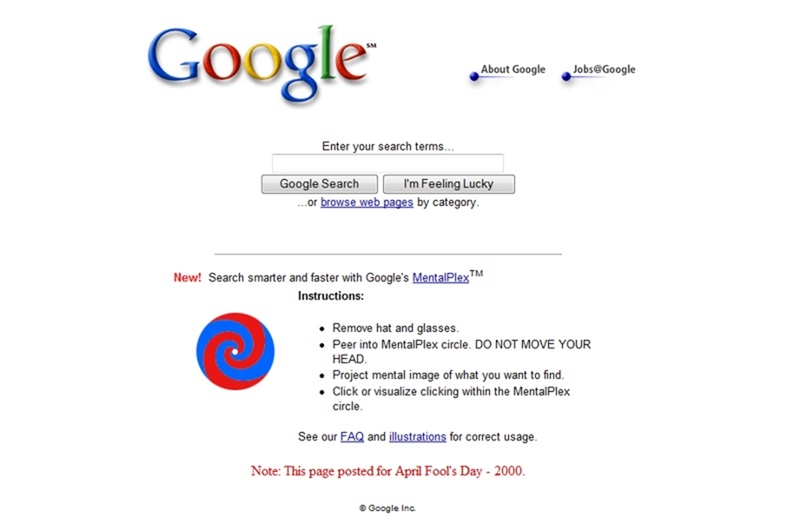 Millions of people world wide tried out the MentalPlex Search only to realize later that Google played an April Fools Joke on them. In 2002 Google created the Pigeon Rank April Fool’s day joke. 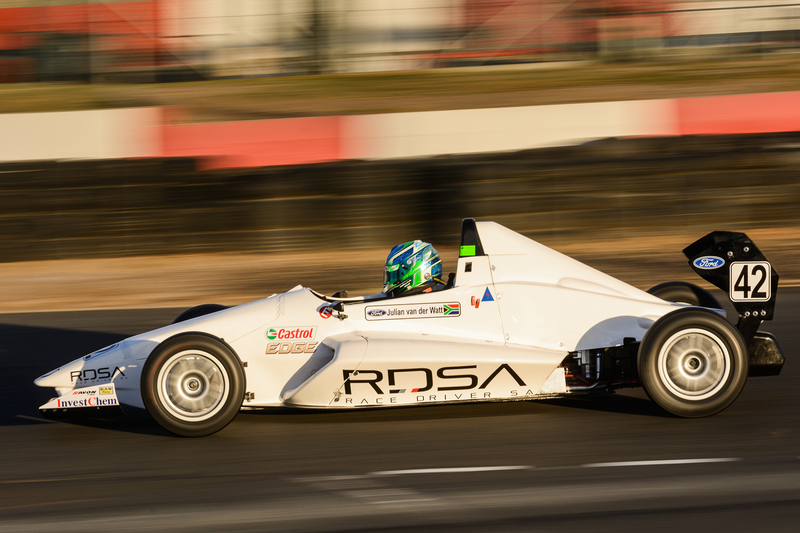 As a Google user, you’re familiar with the speed and accuracy of a Google search. How exactly does Google manage to find the right results for every query as quickly as it does? 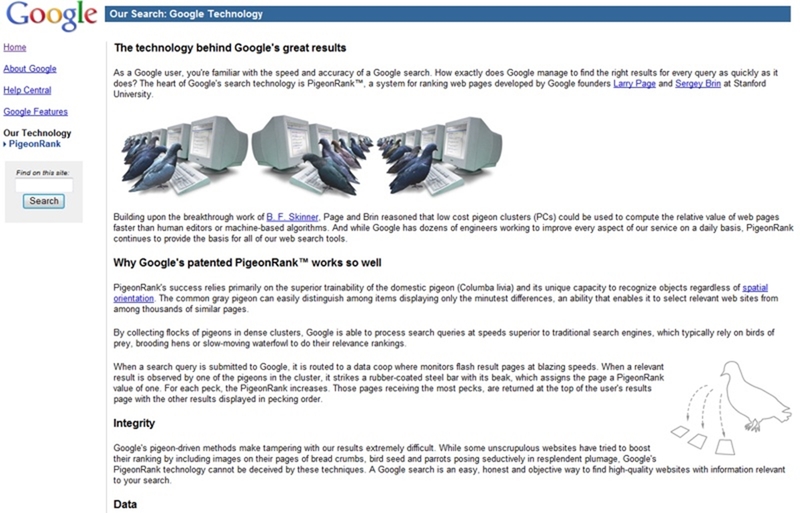 The heart of Google’s search technology is PigeonRank™, a system for ranking web pages developed by Google founders Larry Page and Sergey Brin at Stanford University. Google is interviewing candidates for engineering positions at our lunar hosting and research center, opening late in the spring of 2007. This unique opportunity is available only to highly-qualified individuals who are willing to relocate for an extended period of time, are in top physical condition and are capable of surviving with limited access to such modern conveniences as soy low-fat lattes, The Sopranos and a steady supply of oxygen. The Fourth April Fool’s Joke 2005: Quench your thirst for knowledge. (BETA)™ with Auto-Drink™ (LIMITED RELEASE), a line of “smart drinks” designed to maximize your surfing efficiency by making you more intelligent, and less thirsty. is a place where you can post all types of romantic information and, using our Soulmate Search™, get back search results that could, in theory, include the love of your life. Then we’ll send you both on a Contextual DateTM, which we’ll pay for while delivering to you relevant ads that we and our advertising partners think will help produce the dating results you’re looking for. Everyone loves Gmail. But not everyone loves email, or the digital era. What ever happened to stamps, filing cabinets, and the mailman? Well, you asked for it, and it’s here. We’re bringing it back. 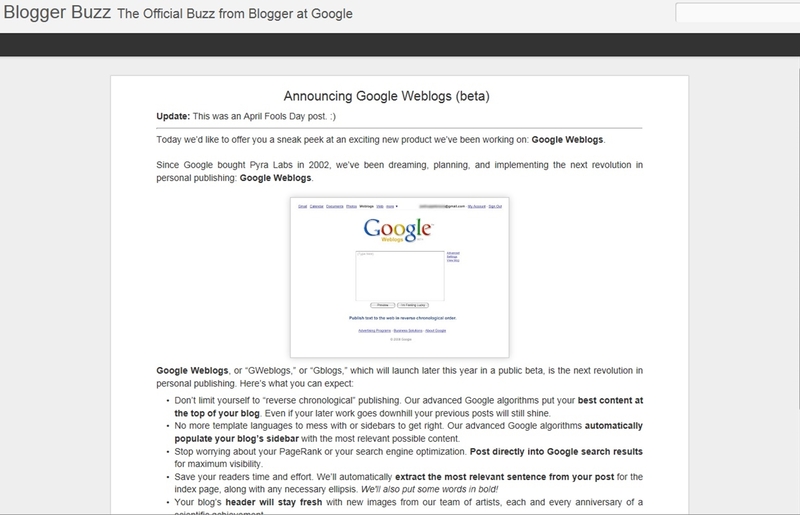 Today we’d like to offer you a sneak peek at an exciting new product we’ve been working on: Google Weblogs. Since Google bought Pyra Labs in 2002, we’ve been dreaming, planning, and implementing the next revolution in personal publishing: Google Weblogs. 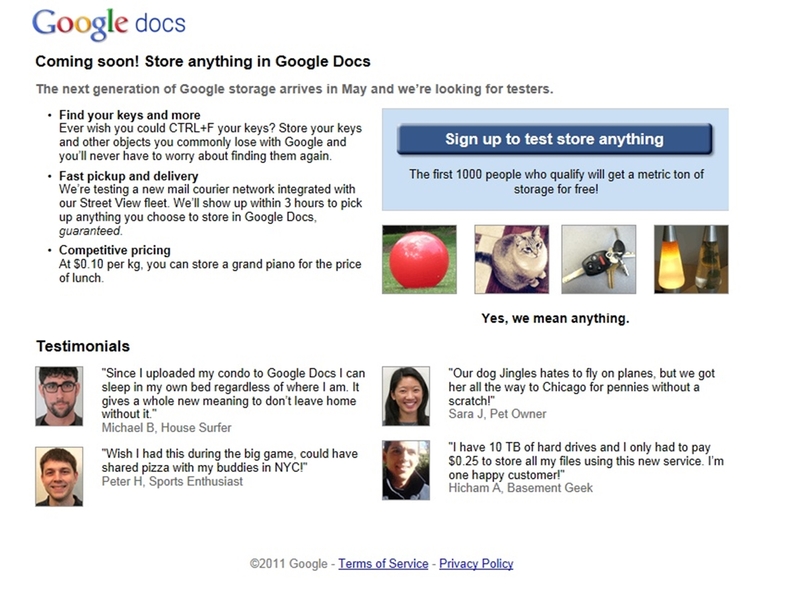 In 2008 Google actually ran several April Fool’s Day Jokes similtaniously on the internet. 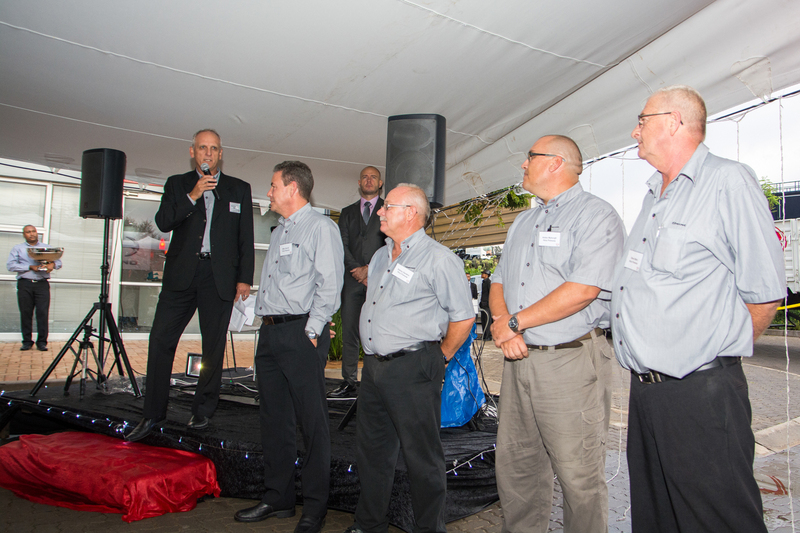 Research group switches on world’s first “artificial intelligence” tasked-array system. 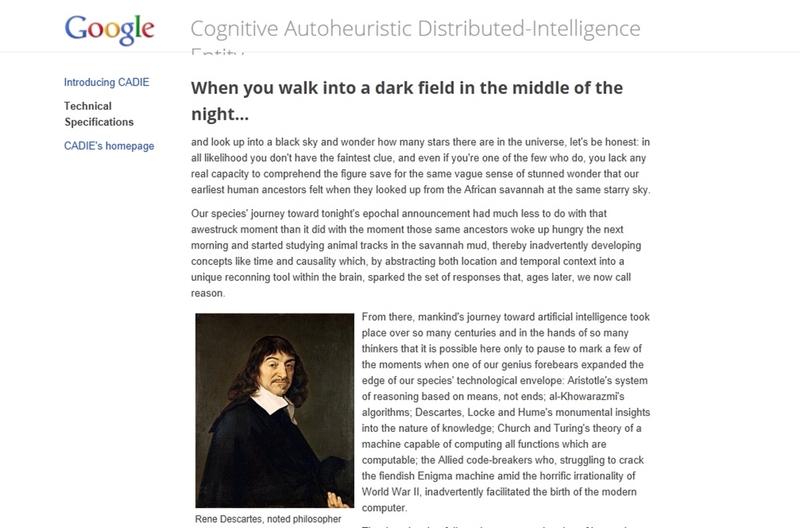 For several years now a small research group has been working on some challenging problems in the areas of neural networking, natural language and autonomous problem-solving. Last fall this group achieved a significant breakthrough: a powerful new technique for solving reinforcement learning problems, resulting in the first functional global-scale neuro-evolutionary learning cluster. In January, we added the ability to upload and store any file in Google Docs, and in response to your feedback, we increased the maximum file size to 1 GB a couple weeks later. Based on the overwhelming response to this feature, we’re happy to announce a big update. Starting today, you can upload and store anything in Google Docs. 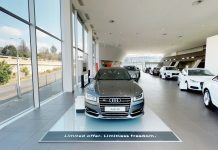 With this change, you’ll be able to store items in the cloud and access them from any computer – all you need is an Internet connection and a Google Account. A new way to communicate: The mouse and keyboard were invented before the Internet even existed. Since then, countless technological advancements have allowed for much more efficient human computer interaction. Why then do we continue to use outdated technology? 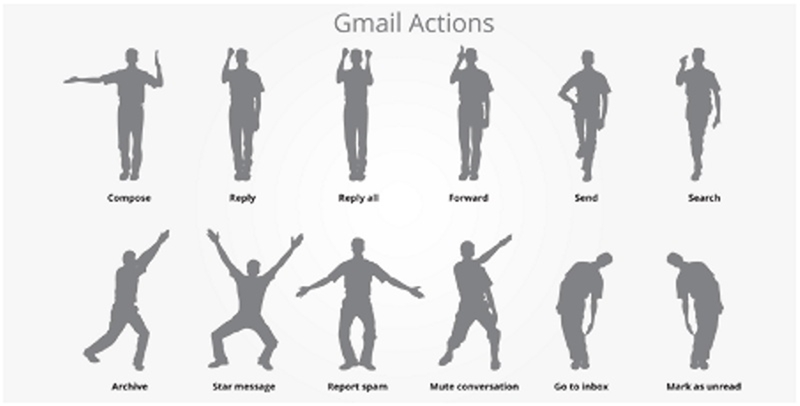 Introducing Gmail Motion — now you can control Gmail with your body. These are some of the Google April Fool’s Day Jokes by Google. 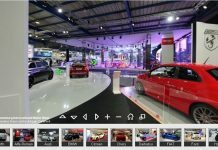 With only hours away to this year’s April Fool’ Day Jokes we here at 3D Car Shows cannot help to think of what Google will come up this year. We are not sure if the Google April Fool’s Day Joke will be announced this year with a special Google Doodle or if it will be done by something discreed. 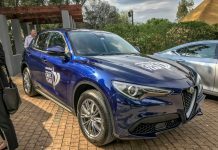 Each year it is becomming more difficult to get a good april fool’s day joke, since many people that have been caught previous years do not want to be the fool again. We will keep an eye out for the best April Fool’s Day Jokes this year and will keep you up to date with any jokes we find! Happy April Fool’s Day! On the April 1, 2012 Google introduced people to their partnership with Nascar. 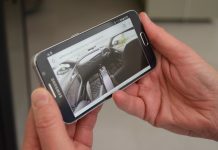 Google have been working on Car Software and Technologies that drive cars by themselves without human input for a while. They have even announced the technology in October 2012 and this makes it really difficult to determine if the Google Nascar Partnership April Fool’s day announcement is real or fake! It may sounds far-fetched but the joke may actually be on the media reporting the joke as a hoax when it might be real. We have included a video from the Google Nascar Partnership, watch it and decide for yourself if it is a joke or not! Google entertained the world today with all it’s different April Fool’s day jokes. In this prank YouTube announce that you can now download their complete database of videos on a dvd. All you need to do is order the DVD and your YouTube videos will be delivered to your door. For me this is more an educational video telling people how big and resourcefull youtube really is and that it would be totally impractical and impossible for any one human beeing to own their own collection of YouTube videos!